I have now been using Macs for almost 18 years. My first hands-on experience with the Mac was in high school, during my junior year, which began in 1986. The school had purchased 25 Mac SEs and five ImageWriter printers and had them networked with LocalTalk. I spent hours in the computer lab, tinkering with them and learning how they ticked. I’ve used every operating system Apple has released for the Mac since that time, and, in the process, collected hundreds of programs, including many games, for these older systems. Most of these are shareware games, but they include a few classic commercial releases such as Prince of Persia and the Carmen Sandiego series. Now I have kids, aged four and six. In addition to my own MacBook Pro and my wife’s PowerBook G4, we bought a clamshell iBook for the kids to play games on and run some of the educational software we have. My son, the six-year-old, loves to play video games, finding some that he enjoys on the Web as well as a few CD-ROM games. I’ve been meaning to get some of these up and running on the iBook for quite a while, but hadn’t gotten to it until recently. As I was doing so, I remembered how much joy I had experienced playing these games, and lamented the fact that I couldn’t play them on my MacBook Pro. Classic isn’t available for the Intel-based Macs. This actually became a real minor problem recently, as a client had some FileMaker 4 files that I needed to look at before converting them, and FileMaker 4 only runs in Classic. But I’ve always been interested in hardware emulation, if for no other reason than I needed first Virtual PC and now Parallels in order to test software I’ve written with FileMaker and REALbasic on the Windows platform. I remembered a few programs out there that emulate old Mac processors, and decided to check them out. Every computer has a central processor. This is the brain of the computer, where all of the computation takes place. In order for a program to work, it sends instructions to this processor. The art of programming is the art of writing out instructions for the processor to perform. Actually, very few people actually write real instructions for the processor. Instead, what they do is write the instructions in a language that can be translated to something the processor understands. This is what it means to compile a program. When a programmer writes software, usually a computer language such as C is used. A compiler then translates the instructions written in C into instructions that the processor can actually understand. In order for a compiler to do this correctly, it has to know what instructions the processor understands. Every processor understands a different set of instructions. This is why when you compile a program for the older PowerPC Macintosh computers; it won’t run, for instance, on Intel-based Windows machines. The instructions are meant for the PowerPC processors, and the Intel processors don’t understand those instructions. The easiest way to think of an emulator is as a real-time translator of processor instructions. Take, for example, Virtual PC. This program allows Intel-based Windows software to run on PowerPC Macintosh computers. It does this by emulating the Intel processor, so that whenever an instruction for the Intel processor is received by the program, it translates that instruction into one or more equivalent PowerPC instructions. Over the life of the Macintosh line of computers, three different families of processors have been used. First there was the 68K family from Motorola, which was used during the first 10 years of the Mac. Then, in 1994, Apple switched to the PowerPC family, designed jointly by Apple, Motorola, and IBM. Finally, most recently, Apple has again changed processors, this time to the Intel x86 line. If this trend continues, we should see another processor switch some time around 2015 or so. Modern Intel-based Macs come with an emulation technology called Rosetta, which enables the new computers to run Mac OS X–based PowerPC software. However, Rosetta doesn’t enable the use of Classic software, just as Mac OS X on PowerPC didn’t allow the use of Intel-based software. In order to use an Intel Mac to run programs written for System 7 or a Mac Plus, you have to provide the computer with your own emulation. Fortunately, the open source community has filled the void left by Apple. There are at least three open source projects out there that will allow you to run Classic software on an Intel Mac (as well as other solutions for running Apple ][ or even Atari software). Getting it working isn’t always easy, but I’ve spent the last few days working on it for myself, so I’ll share my experiences here. There are three primary programs I found for running old Mac software: SheepShaver, Basilisk II, and Mini vMac. I’m actually using all three for different reasons, so I’ll take you through the process of setting each of these up. Although each of these programs allows the execution of older Mac programs, they each do so in different ways, but fortunately, all three have versions that work on Intel Macs. There is, however, a caveat regarding each of these programs. The Mac OS doesn’t rely only on the processor to run. It also needs to have access to a piece of hardware called the ROM, which contains machine-specific instructions for each model of Macintosh. Fortunately, the information on these ROM chips can be stored as a file that the emulators can access. Unfortunately, finding these ROM files online is often difficult, as they are protected by copyright law. Fortunately, if you have an old Mac, there are programs which allow you to copy the ROM to a file that can be used by the emulators. Also, fortunately, I was able to find the ROM files I needed online or on CDs that I never threw away. But it was an interesting process, especially in the case of SheepShaver. SheepShaver was the first program I checked out. This program emulates the PowerPC processor and versions of it are available for Windows, and Linux, as well as PowerPC and Intel Macs. Running SheepShaver to emulate a PowerPC on a PowerPC may make sense if you want to run an OS other than Mac OS 9 (it works with anything between 7.5.2 and 9.0.1). I also installed Basilisk II, which emulates a 68K processor. This means it will run System 0.x through 8.1. Finally, Mini vMac emulates a few of the early Macs, including the Mac 128K, 512K, 512Ke and SE, each of which should run System 0.x through 7.5.3. Why have two emulators of the 68K Macs? Because Basilisk II will emulate either a classic Mac (the first compact Macs with 9-inch black-and-white built-in monitors) or what it calls the Mac II series (which includes Macs with the 68030 and 68040 processors, even though no Mac II ever had a 68040). The latter emulation will run System 7.6, which I wanted to do. But I also wanted to run System 6.0.8 (the last Mac OS before System 7), and it’s easier for me to have a separate program for each OS version. 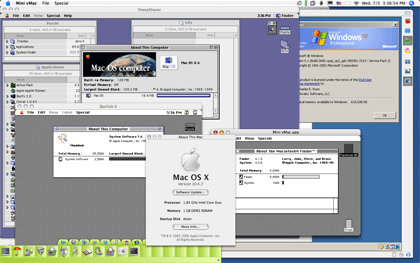 To give you an idea of where our final destination will be, take a look at this screenshot, which shows all three of these programs running on my MacBook Pro, giving a single view of System 6.0.8, System 7.6, Mac OS 8.6, and Mac OS X 10.4.7 (with Windows XP running in Parallels thrown in for good measure). Please note that this is more of a journal than a tutorial. This is what worked for me, and you may have to perform quite different steps to get things working for yourself. However, there are some good places to get help if you need it, and I’ll point these out as we go along. Although it took me a few days to get it up and running, in hindsight, SheepShaver was the easiest of the three to install and configure. This is due to the fact that, while it requires a ROM file like the others, this ROM file can be obtained from Apple installation CDs or update disk images available from their Web site. Installing SheepShaver itself is a snap, simply download it from the Web site, unpack the archive, and drag it to where you want it. 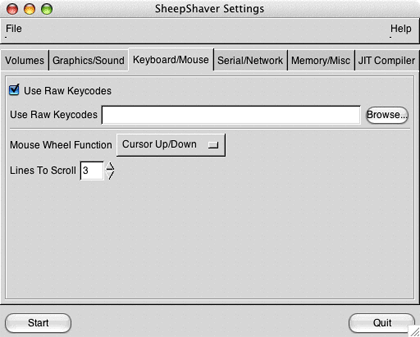 Two applications are included with the download: SheepShaver itself and an application for editing the settings file. First, let me tell about the road to avoid. 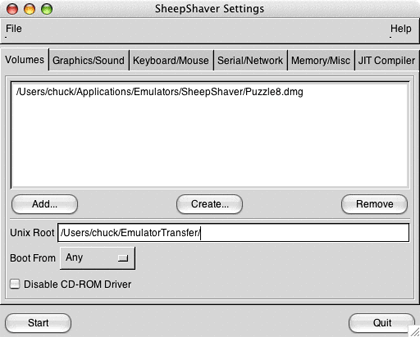 According to the SheepShaver Web site, the software can work with a number of ROM files available from Apple through installation CDs and updates. One listed as working is the ROM image on the installation CD for 8.5. Since I have the 8.5 installation CD, I tried this. After some helpful troubleshooting from a couple of people on the SheepShaver forums, it turns out that this particular ROM file won’t work on a MacBook Pro, and perhaps not on Intel Macs at all (although it may still work when running SheepShaver on other platforms). The path I did take was to get the Mac OS ROM Update 1.0 from Apple’s Web site. Unfortunately, the ROM file is embedded within the installation package, which can’t be read on an Intel Mac. However, there is a classic program called TomeViewer (before Mac OS X installation packages, software was often placed in archives called tomes). The downside here is a catch-22: You need to be able to run classic software in order to use TomeViewer, which you want to use so you can run classic software. In other words, you’re going to need another method in order to extract the ROM file. I have an old PowerBook 1400. This I connected to my Ethernet network by sharing the connection on my MacBook Pro. I copied the ROM Update and the TomeViewer software to the 1400, extracted the ROM file using TomeViewer, and copied the ROM file back to the MacBook Pro. Files were shared between the two by using Mac OS X’s built-in FTP server on the MacBook Pro and Fetch 4 on the 1400, which I also found an old copy of. For some reason, I couldn’t get AppleTalk file sharing to work between the two portables. However you do it, you’re going to need to run TomeViewer under the classic OS and get the update package to the machine it’s running under. The update package is delivered in a self-mounting image, which when double-clicked will mount a disk image on the desktop. Once it’s mounted, launch TomeViewer and use it to open the Mac OS ROM Update Tome file on the disk image. The only file in the tome archive is Mac OS ROM, so click it and choose Archive ‣ Expand from the menu bar. Get the expanded file to your Intel Mac for use by SheepShaver. There’s one more file that you need to download before actually using SheepShaver: a keycodes file. Apparently this is used so that modern keyboards can be used with the older operating systems. The easiest way to get the keycodes file is with the Basilisk II download. In the archive is a file called BasiliskII_keycodes. You can store this file anywhere you like, although the most useful place would probably be in the same folder you have SheepShaver in. Now that you have all the files necessary from the Internet, you need to create one for yourself. This is the disk image that will be used as the startup drive for SheepShaver. For this you can use Disk Utility. Make sure the disk image you create has enough room for the OS and any applications you want to include. I made mine 500 MB in size, which seems more than sufficient. After installing Mac OS 8.6 on the image, I still had over 300 MB available, which leaves enough room for the few applications I wanted to have. Make sure the disk image is not encrypted and that the format allows reads and writes. You can’t use a sparse image for this. Again, a handy place to keep this file is in the same folder as SheepShaver. If the disk image gets mounted after being created, be sure to unmount it before launching SheepShaver. You don’t want to have two operating systems attempting to access the drive image at the same time. Everything is now ready to begin configuring SheepShaver. Launch the SheepShaverGUI application. Most of the settings you see in it can be left as their defaults, but you will want to point the software to the ROM file, the keycodes file, and the disk image file. The GUI application was written in Java, so the interface is far from the OS X Aqua look and feel, but at least you can edit SheepShaver’s settings without using a text editor. In the Volumes tab, click the Add button and navigate to the folder your disk image is in, select it, and click OK. You’ll also want to change the Unix Root. This is the path to a folder on your computer that SheepShaver will grant access to within the emulated OS. It is not recommended that this path be to the root level of your hard drive nor to your home folder. I anticipate using a single folder for transferring files to all of the emulated OSes, so I created folder called EmulatorTransfer in my home directory and set this as the Unix Root. I should note, however, that I was never successful in transferring files with the shared folder. Instead, I ended up mounting Puzzle8 while the emulator was shut down, copying files to the disk image, unmounting it, and then launching SheepShaver. This was a simple enough workaround for me to not even troubleshoot why the shared folder didn’t work. Click the Keyboard/Mouse tab and select Use Raw Keycodes, and then click the Browse button to select the BasiliskII_keycodes file. Go to the Memory/Misc tab and click Browse to select your ROM file. You can also use this tab to set the memory available to the emulated OS. I set mine to 64 MB. If you want the emulated OS to have network access, select “slirp” for Ethernet Interface in the Serial/Network tab. Finally, you can set the refresh rate and resolution of the window in the Graphics/Sound tab. I found that 15 Hz for the refresh rate and 1024×768 worked well on my MacBook Pro. Oddly, the resolution width and height are set separately, but another common resolution is 800×600. You now need to install a classic Mac OS onto the disk image. I used a Mac OS 8 install CD. Although on some platforms SheepShaver can run any OS from 7.5.2 through 9.0.4, under Mac OS X, the earliest supported OS is 8.5. Note that if you have a 9.1 installation CD included with some computers that run OS X will not work. Hopefully someday the more modern OSes will be supported, perhaps even OS X versions, which may prove handy for software testing. To launch SheepShaver, you can either click Start within SheepShaverGUI or quit the GUI application and double-click SheepShaver itself. Since the disk image assigned is blank, SheepShaver automatically starts up off of the CD. Double-clicking the Mac OS Install program on the CD begins the installation process. During installation you are given the opportunity to customize the process. Before clicking the Start button to begin the installation, click Customize. I deselected everything except for Mac OS 8.5, Internet Access, and Mac OS Runtime for Java. For each of these, I kept the recommended installation. Once the installation has finished, restart the emulation and SheepShaver will boot with the installed OS. There are two things I did right away. Included in the 8.5 installation is Internet Explorer 4, which doesn’t seem to work at all with most modern Web sites. I used the 9.1 CD I had to get Internet Explorer 5 onto the virtual machine so that I could browse Web sites with it. It isn’t something I would commonly do, but it would often be easier to get some of the public domain software available onto the system. Once IE 5 was installed, I used it to visit Apple’s Web site and get the 8.6 update and installed it. From there I was able to install some of my favorite old games. Whereas SheepShaver emulates the PowerPC processor, Basilisk II emulates the 68K processor. 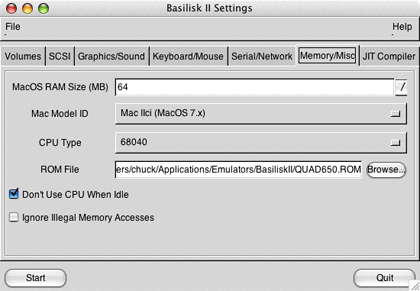 Because Basilisk II is open source (as is SheepShaver), there are a number of binary builds for Mac OS X. I used the version hosted in the same place I got SheepShaver from, which is officially known as Basilisk II JIT. The “JIT” is short for “just in time,” and it attempts to increase the performance of Basilisk II by using dynamic recompilation techniques to translate the 68K machine code into that understood by Intel processors. If that doesn’t make much sense to you, don’t worry, as you don’t need to understand it to use the software. Just like SheepShaver, Basilisk II needs, in addition to the binary executable, a ROM image, a disk image to boot from, and a source from which to install the operating system. In Basilisk II, the ROM image must be an image from an actual computer. Again, these are difficult to find online because of copyright issues. If you have an old 68K Mac, you can use CopyROM to extract the ROM information to a file that you can then transfer to the emulating computer. I don’t know if it will be available long, but I did find a Quadra 650 ROM image available for download from one site. A careful Google search may turn up other locations. Once you have the application and the ROM image, you can create a disk image just like with SheepShaver by using Disk Utility. Again, for me a 500 MB image seemed sufficient. After you have all of these files, you launch the GUI application, which is very similar to SheepShaver’s. Set the disk image, Unix root, ROM image, and keycodes file, as well as any other settings, such as the RAM and the Ethernet interface. I used a 7.6 installation CD in this case, so I inserted it into the drive slot and launched Basilisk II by clicking Start in the GUI application. If you don’t have an installation CD for System 7 through 8.1, you can access System 7.5.3 from Apple for free. Since the disk image was new and therefore blank, Basilisk II booted from the CD-ROM. Unlike SheepShaver, although Basilisk II did see the disk image, it needed to format it, probably because it was formatted as HFS+ rather than System 7’s older HFS format. After this was done, it was simply a matter of running the installer. As with SheepShaver, I disabled most of the options for the installation, keeping only Mac OS 7.6, MacLinkPlus 8.1, and Open Transport PPP 1.0. That last one may not have been necessary, but I wanted to make sure that Open Transport was installed, and not remembering if it was by default, I do know that the PPP control panel (which I later disabled with Extensions Manager) requires the TCP/IP control panel rather than the older MacTCP control panel. The installation took only a few minutes, and once it was finished, a restart booted off of the OS on the disk image. Since we’re moving backwards in Mac OS history, beginning with Mac OS 8.6, then installing 7.6, our final emulator will let us work with System 6.0.8. The first version of System 6 was released in 1988, so we’ll be going back in time 18 years in running it on the latest Mac hardware. We could actually go back to System 1 from 1984, but System 6 is probably the best combination of running software built for the Mac Plus/SE lines while retaining stability and features as much as possible. Just like the other emulators covered, we need the executable, a ROM image, a disk image, and the installation software. 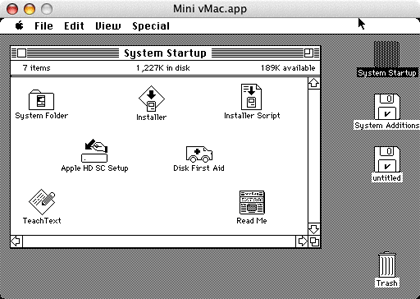 Mini vMac has been compiled to emulate either the Mac 128K, Mac Plus or the Mac SE, and I used the SE version. You can use CopyROM to extract the ROM image from your own SE if you have one (although unless it has an Ethernet card, I don’t even want to think about how to get such a file to your Intel Mac). I did find one for download, although I can’t seem to find it again. I’m afraid on this one, you’ll just need to check around with Google. Once you find one, you need to name it “vMac.ROM” and place it in the same directory as the Mini vMac application. 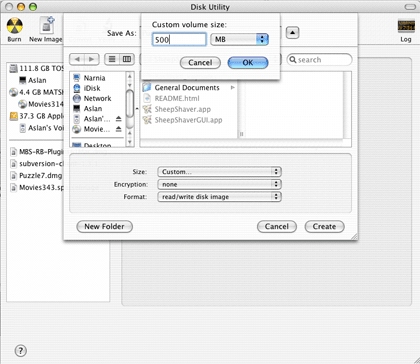 The disk image format used by Mini vMac isn’t one that can be created with Disk Utility. However, the developer has made available an archive of blank disk images that you can use in sizes ranging from 400 KB to 24 MB. Just like the ROM image, the disk image should be placed in the same folder as the application. Like System 7.5.3, Apple offers 6.0.8 as a free download. Once you have the system software disk images (the two 1.4 MB images should work fine, but you can also use the 800 KB sized images), a duplicated blank disk image, and have placed all three in the Mini vMac folder, you can launch Mini vMac. It will automatically mount any images it finds in the same folder it is in. The duplicated blank image should be named “disk1.dsk.” The installation disks can be mounted by dragging them to the Mini vMac window after you’ve launched the program. Know that there are many options and roads that you could take to get classic software on your Intel Mac. What I’ve covered here is simply the path that I took. I find emulation very interesting and perhaps down the road I’ll look into emulating an Apple ][ and an Atari 800 (the two other early computers I used). There are hundreds of educational programs and games available for these older platforms, and many of them are available for free, having been released by the owners. If nothing else, using such emulation brings back a nice feeling of nostalgia. Copyright © 2006 Charles Ross, cross@atpm.com. Charles Ross is a Certified FileMaker 7 Developer and the Chief Technology Officer of Chivalry Software, LLC, a company specializing in custom database, web and automation software and publisher of Function Helper, a FileMaker calculation debugging tool. He was a contributing writer and the technical editor for The Book of FileMaker 6 and has contributed to ISO FileMaker Magazine and Macworld in addition to his series on AppleScript for ATPM. I have been holding off on getting an Intel Mac because HyperCard is still a must-have app for me. Of the three emulators you installed, is there a clear performance leader in terms of speed and stability? Thanks. Interesting question. I didn't really test for speed, but the truth is that each of them was very responsive. I would say that any of them would work well. I have been using SheepShaver most of all because it's running the most recent OS (8.5) of those emulated. Perhaps it's because these OSes are less complex than Windows XP, but none of these emulations were lagging in speed. Whenever I used to run WinXP under Virtual PC on my PowerBook G4, it was always too slow to do anything but a quick check of software I wrote. With these, the responsiveness was always good. I did have a few crashes, but I honestly don't remember which they occurred in. It was either SheepShaver or Basillisk II, but Mini vMac may not run the software you need. My recommendation would be to try SheepShaver first. These don't take too long to set up, so it's cheap to try them out and test to see if the performance and stability are satisfactory for you. This is amazing. And excellent to be able to do. Thanks for sharing it! I've been a longtime vMac and mini vMac user, and totally love it. My beloved SE/30 fell victim to some sort of hardware failure and won't boot any longer, so I used vMac to fill in for it. What about Apple IIc software? Absolutely! Hypercard is why I'm a Mac user. I'm not a programmer, but hypercard lets me build pretty much any little utility app I need. Why be a slave to software that does what someone else thinks I need? Using Hypercard, I've automated sub-titling on our TV program, automated a radio station, made a system to track our viewers and listeners, kick out invoices, manage our stock, and more. The computer does what /I/ want it to. What a shame Apple let it die -- absolutely the most foward-thinking, useful piece of software Apple ever made. I think that Apple considers the modern fulfillment of HyperCard to be found in AppleScript Studio, but I agree that it's a shame that the product has been abandoned. HyperCard was much easier to use than AppleScript Studio. If you're asking about the running of Apple ][ software on modern Intel Macs, a Google search of "apple ii emulation" led me to KEGS-OSX. It doesn't appear to be universal, but perhaps it would allow you to run Apple ][ software. Hypercard was hypertext software done right, on the Mac. It came out in the late 80's and was popular throughout much of the 90's. To my way of thinking at least, it was a basis for how web software works today. Thing is, it was much easier to develop than HTML. Stacks were fun to program, though hypertalk could be a bit of a challenge, it was easier (and more impressive generally) than, say, BASIC. Back in the day, you could make 'stacks' that worked kind of like web sites in terms of database, graphics, 'links' etc. You can get a Mac OS X-specific version here: http://www.users.bigpond.com/pear_computers/ It has a more Mac-like UI than the "gibix.net" version, and is Universal. And don't worry, it does has sound. For the most part, I use Basilisk II, mainly because SheepShaver seems buggy with a 7200 ROM. However, Basilisk II is slow on my PM G3 beige, so I shouldn't really talk. The last iteration of Hypercard totally sucked. I too had been using Hypercard for animation and simple games, and my dad was a HUGE fan of it! Even in the days of Director and Flash (which eventually took over Hypercard) my dad was always saying Hypercard was THE best. Well, the last version wasn't. Despite being in colour, it was incredible SLOW. Emphasis on SLOW. Despite having the latest hardware (and years later I tried it out on a mac which was generations ahead of the Hypercard era... with the same results), it hardly ran any faster than the previous versions. Infact, I preferred the previous versions to the last one that shipped because they launched faster, ran faster, and generally... just fast. Adobe/Macromedia Flash has now conquered what was once Hypercard's area, and has made animation/games/apps even simpler to code. Thanks for the great article! I had looked at Sheepshaver and quickly put it aside because I couldn't find anything like this, a step-by-step how-to-set-it-up guide, and didn't have the determination to figure it out without one! Now I'll go back to it. But I was wondering, since all three of these emulators also are available under Windows, if they would perform better or worse if you had instead installed the Windows versions under Parallels and/or Boot Camp? It would be an interesting experiment! I followed the SheepShaver instructions to the letter, except that I took an installed OS 8.6 from an old Mac, putting that system folder on the disk image before dismounting it. I used the Basilisk keycodes file and the Mac OS ROM from the link in this article. When I start SheepShaver, I get the floppy disk icon with the blinking question mark. This is on a MacBook Pro. What have I done wrong? If I understand you correctly, you copied an existing system folder to a disk image and are atempting to boot from that. If that's correct, then my first suggestion would be to install from a CD. Hopefully you have an 8.5 CD around that you could use. When I was setting everything up, I inserted my 8.5 CD into the drive and SheepShaver booted the virtual machine off of it. If you don't have a CD that you can boot off of, then you might download the free System 7.5.3 that Apple offers on their web site, which will allegedly work with SheepShaver, though I haven't tried it myself. Thanks, but the article says "Although on some platforms SheepShaver can run any OS from 7.5.2 through 9.0.4, under Mac OS X, the earliest supported OS is 8.5." I have a 7.6 CD and would be just as happy to use that version. Has anyone tried SheepShaver with 7.6? I had forgotten that. Sorry. If you have a 7.6 CD, then I suggest trying Basilisk II instead. I was successful getting 7.6 to run under it on my MacBook Pro. I thought that I would by a new Mac Book Pro. I have the money. I'd like to spend it (smile). But I'll just keep my 3 G4 powerbooks going. Apple really should provide an emulater. Do you think that they will? Maybe under Leapord? I'd rather go with SheepShaver than Basilisk, since SS is a PPC emulator. I burned OS 8.6 onto a CD, but SS won't boot from it. I did a web search about making a CD bootable; found bunches of stuff relating to Jaguar and Panther, but nothing about Tiger. The third-party utility "BootCD" is incompatible with Tiger. Disk Utility and its help file have nothing about bootable CDs. This 8.6 system folder is blessed on its original machine. How can I bless it on the CD, if that's the issue? I used the ROM from Mac OS ROM update 1.0 and a system 8.6 install CD. It installed with no problems. My problem is when I try to boot without the CD, I only get the flashing ? I would love to get this to work. Can't have a solution for backward use of classic under mac OSX86 and this is a great disadvantage. I followed the SheepShaver instructions to the letter, except that I used a disk image that I downloaded somewhere, which is definitely a legitimate cd of Mac OS 9. I used the Basilisk keycodes file and the Mac OS ROM from the link in this article. When I start SheepShaver, I get the floppy disk icon with the blinking question mark. This is on a MacBook. What have I done wrong? The ROM file may not be right, I'm not sure - I might have the wrong one - I need one, in any case, that's for Mac OS 9. Hi, I am trying to get Sheep Shaver working.. and have got as far as the ROM file.. The real issue is that I simply don't have any OS9 CDs floating about. How can I get a copy of one? I have an old Power Mac Software restore disc but that doesn't seem to work.. if I point Sheep Shaver to it, it simply disappears/crashes. Nothing happens. Frustrating to get thsi far and be stumped. I also read that I will need at least OS 8.6 or similar. I get SS running fine, booting from an OS 8.6 CD. I can't get it to boot from the system folder on the designated SS .dmg. The instructions say not to mount the image in OSX; I've tried both mounted and unmounted. I tried putting OS 8.6 on a flash drive, thinking that a physically separate volume might help, but it wouldn't boot from that either. I tried installing OS 8.6 on the SheepShaver volume by running the installer from the Apple CD, rather than manually placing the system folder on the volume. And it now works fine! Comparing speed by a spellcheck of a 48,000 word WordPerfect document with footnotes, my 1.25 Ghz PPC G4 iMac took 16 seconds, and SS on a 2 Ghz MacBook Pro with an Intel core duo chip took 20 seconds. I will post more (as I learn more) at http://tech.groups.yahoo.com/group/wordperfectmac. Thanks to everyone for this article and discussion! I'm stumped about printing. Gwenole Beauchesne's Wiki has config files for most platforms but not OSX. In SS GUI, I don't know what to put in the printer port entry box in the serial/network tab. Using SheepShaver on a MacBook, I tried to do an install from a PowerBook OS 9 install CD. Booted on the CD, but got a message that the installer would not work on my Mac. Copied a working OS 9.0.4 System folder from another Mac, but SS gave me a blinking "?" So here's what worked: With the 9.0.4 folder on the virtual disk, boot from the CD. Using the CD's OS, bless the 9.0.4 folder (open the folder, double-click the system file. When it opens, close it, then close the folder, which should now have the smiling faces on it). Use the CD OS's "Startup Disk" CP to select the 9.0.4 folder. Reboot. I'm having trouble with TomeViewer - I downloaded it thru VersionTracker (the link above didn't work), unstuffed it, also downloaded ROM Update 1.0 and double-clicked it. When I run TomeViewer and choose the ROM Update and Archive>Expand, I get an error "There was a problem decrompressing the file "Mac OS ROM". (-43)"
I have 7 macs. 5 came with os9 discs. I have so many os 9 licenses I drown in them. BUT, I currently have no machine with os 9 installed at all...When Tiger came out I finally just bit the bullet. The only reason I wanted os 9 was so my kids could run their games in classic mode. It sounds to me like I need classic to extract certain tome files and what not....but ultimately I am going to need the os9 discs to make it all work. It seems like you make the 'other' pre-install disc files available for download without breaking copyrights, as they would indeed prove useless to the person that doesn't have discs to begin with?? I am stuck. I woudl love a downloadable version of a disc image that would then allow me to pop in the discs I do have and boot up. 1) Get your brother to make a drag copy of his system folder onto a CD and send it to you. 2) Drag that copy onto your "OS 9 disk". 3) Boot sheepshaver and let it load an OS from the Install CD (the one you can't install from). 4) Using the OS 9 that loaded from the Install CD, tweak the OS 9 system folder you dragged there to bless it (open the system folder, open the system file, close file, close folder; folder should have smiley faces). 5) Use the Startup Disk CP to select your newly blessed OS to boot from. I thought I would need 9.04?? Can I just drag my system folder from the install discs..???? Well, the 9.2.2. thing is a problem, I think. SheepShaver says you need 9.0.4 or earlier, and 9.0.4 is the one I drag-installed. I believe the OS on the CD is "special" in order to boot from a read-only device. I'm not surprised that it won't boot after you dragged it. You can get some version of OS 7 from the Apple site; why not try that, while you look for a way to get a newer version. Once you get any version of the OS running, you might be able to install "Wish I Were" (not sure of the name) or one of the other hacks that make your Mac appear to be a different model than it really is. At that point you might be able to trick your install CD into thinking it's on the proper kind of Mac. When I launch Sheepshaver 2.3, under Mac OS 10.3.9 I immediately get an error message that the application has unexpectedly quit. I neeed to do a force quit. However, I can see the window for the emulator. Any suggestions? I am trying to get SheepShaver 2.3 running on my MacBook Pro (Core 2 Duo/OSX 10.4.8). I followed all the steps in the article; it boots fine from the CD (OS8.5 installer from a G3 Desktop) and goes through the install OK. The system folder in the target disk has the "blessed" icon. However, when I try to restart without the CD, I just get the blinking "?" as if it can't find a valid system. At that point, SheepShaver won't quit and I need to do a Force Quit. I tried SheepShaver on my PowerBook Ti and on my iMac G4 Flat panel. Behavior is the same on the 2 macs. Given the number of people having trouble with the installation of SheepShaver, I would like to apologize that I'm not able to be of more assistance. The above article was meant to report the success I did have in getting SheepShaver working on my MacBook Pro, but I'm nowhere near an expert with the software. When I had trouble, I went to the forums for assistance, which is what I would recommend for others reporting trouble here. You can find the forums at http://www.emaculation.com/forum/, where there's a SheepShaver category. I would suggest that anyone having trouble with the software post their questions there, as that is where you'll find the experts with answers. Encouraged by this original article, took the plunge and got an Intel iMac. Installed OS 8.5 from an original install CD. Had some extensions conflict that would crash SS upon most boots, but was able to download and install the 8.6 upgrade. Seems quite stable now. Installed the Japanese language kit. Mostly works as expected, though it quickly loses network connections to file sharing Macs. Very, very helpful piece of software! I'm not holding my breath, but Apple really ought to revive old OS support on Intel Macs. Gotta be at least as many people wanting to run Classic on Intel as there are who want to run Windows! Thanks for the original article! I have followed your instructions, using my old PowerMac G4, up to the part about installing the OS. I must have thrown away my OS versions prior to 9.2.2. Is there any way that SheepShaver will work on my new Intel Mac if I install OS 9.2.2, or do I have to locate a copy of OS 9.0.4? c/o the well documented problem with the ibookG4 logicboards (which Apple won't endorse, asserting incorrectly that the problem was only with the ibookG3 boards) my ibook died even though i'd had it less than 2 years and looked after it with kid gloves - - so I was forced to getting an intel based macbook - which doesn't support OS9 - the whole situation is something Apple really shouldn't shrug off in my view. im succesful install mac os 9.0.4 on intel mac with sheep shaver but why it cannot start up with HD it still startup from mac os 9 intaller CD. any suggestion??? What would be the latest version of hypercard to run in an old Mac SE FDHD running System 6 ? Is there possible to program/create apps using hypertalk using system 6?? -- I found a posting on the Emaculation forums (http://www.emaculation.com/forum/viewtopic.php?p=22957) that said not to use the Disk Utility to create the Mac drive image -- instead use the Create option in the SheepShaver GUI app. This fixed the problem of not being able to boot off of the hard drive after installing the System Software. I installed 8.5. During installation I was prompted to initialize the "drive", and all was okay. -- Also, per the same thread, don't use the Startup Disk control panel to set the startup disk. I found that it wasn;t necessary after using a drive image created by SheepShaver. -- For transferring files from the Mac OS X (I'm running 10.4.8 on an Intel Macbook), I created a second disk image, this time using the Disk Utility, and per the instructions above: I have the second, Disk Utility created partition in the SS list (AFTER the Sheepshaver created image!). I shut down the SS emulator; mount the Disk Utility disk image, and copy files from my old G4 to that mounted image in OS X. The I unmount the image, and start up the emulator. Both the SS-created image and the Disk Util created image appear on the Mac classic desktop, and I can copy files btwn the images. What's the advantage of the second disk image, rather than shutting down SS, opening its disk image in OSX and copying files? I have built a disk image containing the OS, WordPerfect and several utilities, all ready to go. Download it, set SheepShaver prefs, and run. Link (and support for it) at http://groups.yahoo.com/group/wordperfectmac/ in Links > SheepShaver and Basilisk > SheepShaver-WordPerfect Install (2). After about a week fiddling with Sheepshaver on my MacBook Pro, I have it running. There are some small glitches, but it is doing OK. However, I know need to load a couple programs that run under system 9. With SheepShaver running, I've inserted the CD and it isn't recognized by SS. I can't drag it from the OS X desktop to SS, either. How do I get my old programs installed? Help would be appreciated! Thank you for this detailed guide. It helped me a lot trying to get some old games running. I'd love to run HyperCard on my intel mac. I have a "2.16GHz Intel Core 2 Duo"
Whatever that means, I am totally not technical, but can program HyperCard like a breeze. So, can I get this working??? I'm totally lost in reading through all this. Can someone walk me through this like I'm a 6 year old? Can you access the seial ports- via a Keyspan USB adaptor- with these emulators? Been searching for weeks for some way to run my old software on this MacBook. THANKS! You explained this better than any of the dozen or so other webpages I've visited. It's still all Greek to me at the moment and I'd rather pay someone to set this up then to consume all of this information necessary for me to do it myself. I got stuck with one of those ibooks that had the bad logic board! Apple kept repairing it and it kept breaking! Now I need to get Fireworks, Flash, Dreamweaver, and several other programs running again! Apple should have created something to support this! Are there any shops in the Philadelphia area that will do this? I finally get sheepshaver to boot up from the installation disk. But when i go to install os 9 icon, i get this message, "this program cannot run on your computer. See documentation for more info." I have done everything that has to do with Sheepshaver like, made a disk image (500mb), got the ROM, transfer file. Can someone help me with this problem..
i just got a mac pro and i was encouraged to buy parallels, but a friend says it is ridiculous to do so. she also claims that i do not want to be running rosetta, and that i'll mess up my new machine. i would like to try this, as i still have my mac classic and i could run mac paint and superpaint(i loved those programs) as well as os 9.1 programs, like Kai Power Tools on my G4, that would be terrific-but do they run r-e-a-l-l-y slow? and will this work on a mac pro/266 ghz? or does it only work on your mac book pro from last year? Hi all, I am about to setup my first Intel mac for the office network I am the Admin for. I have been desperate to get this problem of Classic on Intel solved. SheepShaver appeared to be the key since no one has hacked the Classic.app or Classic.prefPane. (There is really no reason Apple can't make these work through Rosetta) As to the previous user Rosetta had some issues but since 10.4.9 all has been good except for some really obscure problems. 1. I was unable to create a disk image from OS X Disk Utility that would work with SheepShaver. Got a -8812 or -8816 error in OS 9.0 install CD. If i tried to create an Image in Disk Copy OS9 from CD I could only make a 200MB image. Any larger would also give an Error. I have since installed all updates I felt I needed (i.e. Carbon-Lib 1.5, QT6, AS-client 3.8.8, etc.) making a very clean install of 9.0.4. 1. Networking is Dead, I have setup SSGUI with "slirp" but it appears to not be working as it should. I get nothing and if I do anything to goto the network OS 9 SS will lock -up. 2. Copying of any Files to the UNIX Dir. which I have at /Users/Shared/MacOS/ results in file that are unusable by any Apps or the System. The .smi update files I DL from Apple or even a simple Quark doc Copied from my server shows with a blank icon and can not be read. The only Workaround I had was to use that 200MB image I made in Disk Copy OS9. It can be mounted on Both sides in SS OS9 and in OSX. I Copy all files I need to move to it in OS X unmount and mount in OS 9. Files appear to have NO Type/Creator code look but even a .qxd on the Quark file and no go. I can't even get it to work if I copy .qxd file to startup Volume from UNIX Dir.. I would like a better solution and I'll post it if I find one. Thats about it for now. The Networking thing is Key since if I could Mount my OS X Server Shares I would have no issues really. BTW I have checked the Permissions on all file and Dir. in use by SS and 90% sure thats not the issue. For me, SheepShaver cannot boot from a disk formatted as "Extended", it needs to be the old (pre OS 8.5?) "Standard" format. Hence the need for Creating the startup disk with SS GUI I guess, formatting it as Standard at the OS 9 prompt. The "Unix" shared folder seemed to work just fine at first. However, as it turned out, transferring files that way made some characters get substituted and some files were not found by OS 9.0.4. I created several disk images with OS X Disk Utility, as the Extended format works fine for Classic to use other than booting from. Then Add the images under SheepShaver GUI. This way, OS 9 has the SS boot disk, the Unix disk/folder aswell as a couple of disks usable by both OS 9 and X.
SheepShaver and OS 9 crashed severly on me at one point, leaving the OS X images unreadable by OS 9. I made new images under X, transferred the files, and set SS GUI to the new ones. Fixed. I also chose a higher refresh rate to get OS 9 to run faster, which seems to work great! I followed the instructions above step-by-step. "This Program cannot run on your computer. See the documentation for more information." Does anyone know why this would happen ? Most likly the 8.5 disk you have was provided to you with the purchase of a new Mac. Mac OS install disks are sometimes encoded to work on ONLY the series of Macs it ships with. The installer will not let you install the OS on an iMac lets say if the OS disk shipped with a Blue and White G3. You need a clean store bought full install of the OS or a disk installer that does not have that limitation. This excellent article does not cover file transfer in Basilisk II. I found that creating a transfer disk image from scratch in Disk Utility did not work - the 68k system in Basilisk did not recognize it and wanted to reformat it. The trick that worked for me was to take an "old" Mac volume (ie recognizable by the 68 k file system), in my case a System 8 installation CD, making a disk image copy of it (format read/writeable), empty it of its contents and then use that as the container for the transfer folder pointed to in the "Unix root" field (the disk image has to be added in the Volumes list too) in the Basilisk II GUI or preferences. File import into Basilisk II will work nicely through this folder. Export of files can be done via the "Unix" disk on the Basilisk desktop. For changes in the transfer folder to be seen, it must be updated. This is done in SS by restarting the PPC system, in MacOS X by unmounting and remounting the disk image holding the transfer folder. Good luck. Followed the directions and got the OS 8.6 CD installation disk booted on a Intel Mac Mini. The only thing that came up was to format the drive and Uniex was the only drive available. How do I get it to recognize the disk image that I created in disk Utilities and stored in the SS folder? I cancelled the installation and the CD window opened with Uniex up and no other drive. Can Basillisk II be set to run in 24-bit addressing mode? So far, whenever I set 24-bit addressing in the Memory Control Panel - close it and re-open it - the setting has not "stuck." Restarting the emulator from the point of just clicking 24-bit addressing does not work either. I am running Basillisk II on a PowerBook 12 (G4) using a Quadra ROM and System 7.5.5.
just downloaded sheepsaver to try to play the old myst and star trek (25th ann.) games on my macbook pro..
i dont have any old OS discs or anything like that, the sheepsaver i downloaded came with OS 9 and 3 blank HD's 400meg 800meg and 1.2meg. the document could not be opened b/c the app program that created it could not be found. could not find translation extension with appropriate translators. what does this mean? and how do i fix this? Also, i am having a hard time finding the sheepsaver settings menu you've got on the site, its not in the drop down menu on my osx background so i dont knwo where else it would be. im sure this is a stupid question, but i dont know any mac users to lend a hand.. I've read that SheepShaver will run the classic Mac OS on a Windows machine. While running OS emulation on a Tablet PC, would tablet digitizer functionality be present? I found your article of vital importance to me since I still have some old medical programs only running under Mac 0S 9. However, I also found it a little complicated, especially finding out and manipulating the files needed for SheepShaver to work. Would it be possible to get them from you, let's say, as a disk image? Thank you for your help. There's a disk image for download at the WordPerfect Mac Yahoo group, with everything you need to run SheepShaver. The Command -Key ist not working in SheepSaver with the Keycodes from BasiliskII. Is there any work around.iam working on Powerbook under System 10.4.9 and The SheepSaver runs in 9.04. What version of MacOS 9 are you trying to use? The most modern version Sheepshaver can use is MacOS 9.0.4. Don't try to use an install disk for a later version. Wow, what a lot you've done. I have thousands of Resolve spreadsheets I'd like to be able to open in iMac Intel, just to read, if required. Help to do this would be appreciated please. My problem is the other way! Can I run an intel only app - or one that says 'an intel processor' in its minimum system requirements on a powerpc based mac? I have just managed so far to get OS 8.5 installed at my MacBook Pro. Everything works fine as long as I boot from the CD. When booted from the CD and I just think about asking for another start disk in the control panels, SheepShaver crashes. Additionally I would like my Classic to run OS 9, but I have still not managed my computer to accept this fact. That pre set up one works fine! I had to change to QT 6 to get starship titanic to work, though. I have been a long time Apple owner/user. For years have faithfully backed up all files important to me on LaCie external hard drive or on CD's. Can no longer open most of these files but get the message, "You can't open this application because the Classic Environment is no longer supported". Please, is there any way I can open my files? I am too old to go through a long and tedious program. I have an Apple Mini and an Apple MacBook both running Mac OSX Version 10.5.8. Thanks. Joseph - It seems pretty clear that it's a somewhat tedious hack to get Classic working on an Intel Mac, so I suspect you only have two options. 2) go on eBay or Craig's List and buy an older Power PC Mac that you can use temporarily and possibly network to your new machine to copy over your items. I should point out that it's probably not your documents that have the problem. It's Classic *applications* that can't run on the Intel, not the documents. Sounds like you're trying to run old Classic apps. Another solution may just be to get the newer versions of whatever applications you're trying to use that can run on Intel machines and use those to open/upgrade your documents. There are things in system 9 that I still miss. It was so easy to write macros in AppleWorks 5. I'd gladly pay someone $100US for a cd that I could use to install my OS 9.2.2 on a Mac Intel. I open most all my old AppleWorks in iWorks 09. My PageMaker files in Creative Suite. The old computer is on my desk now I have to find the cords and hook it up, if I can. "It seems pretty clear that it's a somewhat tedious hack to get Classic working on an Intel Mac"
It was originally, but enterprising souls have written installers and such that make it easy. See http://tech.groups.yahoo.com/group/wordperfectmac/, in Links > SheepShaver and Basilisk. Hi, Folks, it's me again. I decided to forget trying to startup my old Power Macintosh G3 computer. I cannot find the power cord, mouse and other accessories. It is not worth all the labor to get back the files I had backed up. I still think that it was short-sighted of Mac, encouraging backing up of important files then selling us new and improved OS's that make our back-ups completely unavailable. I am dropping my quest and giving up trying. What kinds of files are you having trouble with -- that is, what apps created them? Have a near "Non Classic" subject on which I would appreciate help. Have an Apple iBook which on 10/27/07 was diagnosed as having a Faulty Logic Board by Apple Genius Desk People. The cost of repairs scared me so I bought a new MacBook at that time, encouraged by the Genius group to "get a new computer with more memory, etc.."
I could never get the iBook to start up and wondered if anyone knows where I could get it fixed without having to take out a 30 year mortgage to pay for it. That would give us a spare laptop and who knows, it might help me open some of my "Classic Bound" files. Anyone? If Question #83 is meant for me, the files I can"t open are varied. Some were created by me in word processing, many are photos from my iPhoto, while others were emails from friends and relatives of important happenings. I just saved all types and put them on my LaCie external hard drive or CD's. Hope this answers #83. As you can tell, I am not an expert in computers, just picked some things up over the years and speaking of years I am 84 and do not have the energy of a young man. Thanks for everything. Word processing documents can be opened in most text editors; some of them will even honor the document's formatting, but even the ones that don't will give you access to the text portion of the document. Emails, also, are usually just text documents, although some email clients (Eudora comes to mind) store all your messages sequentially in one large file. Photos are almost undoubtedly JPGs (or possibly TIFFs), and can be opened in many OS X apps. For all of them, though, double-clicking on the file *may not work*. Instead, try dragging the document onto an OS X app's icon, or opening the file using the "Open" dialog from within the OS X app. True, there are older (and current) apps that use proprietary formats, but most of the time the problem can be solved by telling a specific app to open the file rather than telling the file to find an app for itself. Try "TextEdit" for anything that probably contains text, and "Preview" for anything that's probably an image. I am particularly partial to "TextWrangler" a wonderful text editor which is free and worth a whole lot more than that. One of the reasons I like it is that it will open *anything* you drop on it. It will even display JPGs. Once you've got your files open in any OS X app, you can edit them (or not) and save them out, being sure to use the "Save as..." dialog, which will "attach" the new version of the file to the OS X app you used to open it. Also be sure to save the new file on your OS X Mac's disk so you can get to it easily in the future. Isaac, if I had your e mail address I would send these comments to you that way. Anyway, I have some news for you. Remember the old adage "A Little Knowledge is a Dangerous Thing?" Well, I am super dangerous, since I have very little knowledge. I was successful in reading several of the files that were unavailable to me. Here is what I did. I moved the file to Applications, Highlighted It, went to Finder/services/Text Edit/Open Selected File and suddenly up popped the untouchable file. I was able to do this to 4-5 files and print them. Thanks for your help. Glad to be of help. Try the same thing using "Preview" to open those image files. compiling, configuring... who has the time, less when u do not possess the knowledge? can anyone just make a pre-configuerd program for macs running leopard to run mac os9. I just want to play Rescue (2.0.5)!!! if some one can help me please contact me!!! I'd like to run an old OS system based application to run on my Intel based Mac Pro (Dual Core Intel Xeon). I found your page here being very useful, the best I found around in order to get a help to emulate the Classic environment on a new Mac. at point 1: "E-Maculation has a downloadable OS 7.5.3 starter disk already prepared"). When I point Sheepshaver starting from this volume, as the Classic env. attempts to start up it says: "This startup disk will not work on this model. Use the latest Installer to update this disk for this model. [Restart]). As this ended up not working, I tried then copying the content of the same starterdisk file to another dmg mounted volume that I created with Disk Utility. Do you have a suggestion on how to create a volume that contains a valid system for Classic to correctly boot up, just using the Intel computer I use? What an excellent bit of information.